Robert E. Lee in Charlottesville's Emancipation Park, soon to be on his way somewhere else. 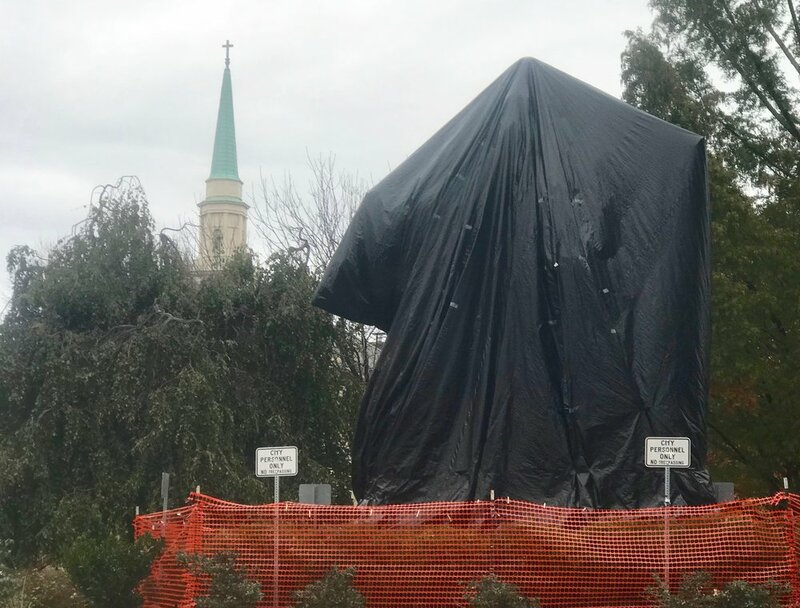 Charlottesville, Va. – Gen. Robert E. Lee still sits astride Traveller in what used to be called Lee Park, but the park is now officially Emancipation Park, and Lee and his horse are wrapped in what looks like a giant black trash bag. A few blocks away, in Justice Park – which used to be Jackson Park - a statue of Gen. Stonewall Jackson suffers a similar indignity. City officials say they wrapped the statues to mourn the death of Heather Heyer. Heyer, 32, was killed while protesting a white nationalist rally called to protest the city’s decision to remove the statues. The statues remain in place while a lawsuit challenging their removal works through the courts, but meanwhile the trash bags covering them tell the world that the voters of Charlottesville, at least, no longer salute Confederate generals. The statues, will eventually be moved to a less prominent spot, and life will go on. For now, Lee and Jackson are in transition, much like the commonwealth they served. This month’s election marked another step in Virginia’s transition from Republican red to Democratic blue. Until Barack Obama came along, Virginia had voted Republican in 10 straight presidential elections. But over the last decade, the turnabout has been swift: Republicans haven’t won a statewide election for any office since 2009. This year, more than any other campaign in the country, the Virginia governor’s race was billed as a referendum on Donald Trump, and Trump lost. Neither Trump’s tweets nor his issues could keep the Republican candidate from suffering a nine-point thumping. Democrats were fired up over Trump, and united behind Ralph Northam, a mild-mannered moderate, while Republicans were divided over Trump and their nominee. Ed Gillespie, a pillar of the Washington Republican establishment, campaigned on Trump’s agenda, beating the drum in favor of Confederate statues and against sanctuary cities. It was supposed to fire up the base, but it probably cost him more votes than he gained. Virginia’s vote is also a reminder that every election begins with a new electorate. New voters register, old voters die out. People move into the state and people move out. Regions boom and regions sputter. Over time, the political profile changes. In Virginia, the boom has been in NOVA – the Washington suburbs in the northern part of the state. The DC metro area’s economy has thrived in good times and bad, partly with the growth of the national security sector. It has also become a hub in the global economy, generating thousands of jobs have been filled by people – young, educated, diverse and culturally liberal – who lean left. The population of Loudoun County, for instance, has grown ten-fold since 1970, to more than 375,000. This year Loudoun, which stretches from the outer suburbs deep into the countryside, gave the Democrat 60 percent of its votes. By contrast, Lee County, in the far southwestern corner of Virginia, gave an even bigger margin – 80 percent – to the Republican. But Lee is a rural county with less than 25,000 people, not many more than it had in 1970. Americans are divided in many ways today, but one of the most distinct is seen in the places we choose to live. In Virginia, and most other states, cities and suburbs trend Democrat and rural areas trend Republican. The denser the population, the deeper the blue. The contested territory is on the fringes of metropolitan areas, where the office parks meet the farms. Republicans take pride in the broad swaths of red on our election maps. Trump has bragged about the large number of counties he won in 2016. But a lot of those counties have hardly any people in them. According to the Department of Agriculture, 72 percent of America’s lands are rural, but just 15 percent of the population live there. Republican Gillespie won twice as many Virginia counties as Democrat Northam, but acres aren’t votes. Not all Virginians are comfortable with this transition. “DC should annex NOVA and return the governance of Virginia to Virginians!” evangelist and Trump supporter Jerry Falwell Jr. tweeted. But state boundaries are fixed in place. Metropolitan areas grow by their own rules, rolling over state lines and complicating the politics of neighboring states along the way. You can’t redraw state lines for political advantage like you can legislative districts. The way to win elections is to engage people, in every city neighborhood, suburban mall and country diner, on the issues you and they care about. Virginians told pollsters this year they cared most about health care – expanding Obamacare, not repealing it – much less about guns, taxes and immigration. And in today’s Virginia, statues of Confederate generals don’t seem to carry much weight.